^ Eksplosjonen i Oslo sentrum 22. juli 2011 [The explosion in Oslo 22 July 2011]. 23 July 2011 [1 August 2011]. （原始内容存档于2012-04-17） （挪威语）. ^ Notat – Redgjørelse Stortinget (PDF). Politiet. 10 November 2011 [10 November 2011]. （原始内容 (PDF)存档于2013-07-06）. ^ Slik var Behring Breiviks bevegelser på Utøya. Aftenposten. 16 April 2012 [16 April 2012]. ^ Ross, Brian. Oslo Explosion: One of Two Blasts Result of Massive Vehicle Bomb, Sources Say. ABC新闻. 2011年7月22日 [2011年7月22日] （英语）. ^ 挪威悼念連環襲擊案死者 疑兇聲稱有同黨. 香港電台. 2011-07-26 [2011-07-26]. ^ En av de sårede fra Utøya døde på Ullevål sykehus. Dagbladet. 24 July 2011 [24 July 2011] （挪威语）. ^ Norway massacre: Breivik 'planned to kill politicians'. BBC News. 18 November 2011. ^ 挪威首都大楼爆炸案已有2人死亡多人受伤. 网易. 2011-07-22 [2011-07-23] （中文（中国大陆）‎）. 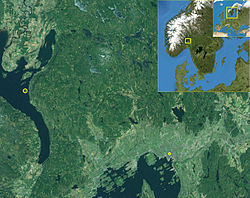 ^ Police scale down: 68 killed in Utøya. VG Nett. 25 July 2011 [25 July 2011]. （原始内容存档于2011-11-14） （挪威语）. ^ 高轶军. 挪威爆炸枪击事件系“本土男子所为”与国际恐怖组织无关. 人民网. [2011-07-23]. ^ 13.0 13.1 13.2 LISA MALA, J. DAVID GOODMAN. At Least 80 Dead in Norway Shooting. 纽约时报. 2011-07-22 [2011-07-23]. ^ 14.0 14.1 14.2 As it happened: Norway attacks. BBC新闻. 2011-07-22 [2011-07-23]. ^ Oslo: Bomb blast near Norway prime minister's office. BBC新闻. 2011-07-22 [2011-07-23]. ^ Oslo explosion: seven dead, dozens injured after Norway city blast. The Telegraph. 2011-07-22 [2011-07-23]. ^ 17.0 17.1 Norway mourns twin attack victims. BBC News. 2011-07-23 [2011-07-23]. ^ 18.0 18.1 Michael Winter. 17 dead in Oslo bombing, shootings; Norwegian held. 今日美国. 2011-07-22 [2011-07-23]. ^ Duxbury, Charles. Deadly Attacks Shake Norway. 华尔街日报. 2011-07-22 [2011-07-22]. ^ Rayfield, Jillian. Oslo Bomb Attack — Eyewitness Reports. LiveWire (Talking Points Memo). 2011-07-22 [2011-07-22]. （原始内容存档于2011-07-24）. ^ Oslo bomb — latest updates. 新闻 (英国: BBC). 22 July 2011 [2011-07-22]. ^ Bomb blast rocks downtown Oslo. RT. 2011-07-22 [2011-07-22]. ^ Oslo-trikken: – Det er normal drift, ingen grunn til bekymring. TV 2 (NO). 2011-07-22 [2011-07-22] （挪威语）. ^ All trains shut down after suspicious package. Dagbladet (NO). 2011-07-22 [2011-07-22]. ^ 於特島﹕ 培育政治領袖場地. 明報. 2011-07-24 [2011-07-24]. ^ 袭击由本土极端分子制造. 新浪新闻中心. 2011-07-23 [2011-07-23]. ^ Police: 91 youth campers dead in mass shooting, bombing in Norway. CNN (美国). 2011-07-23 [2011-07-23]. ^ Flere unge skutt og drept på Utøya. 挪威广播公司. 2011-07-22 [2011-07-22]. ^ 32.0 32.1 32.2 32.3 Norway police say 85 killed in island youth camp attack. BBC新闻. 2011-07-23 [2011-07-24]. ^ 33.0 33.1 survivors pretend to be dead. CNN新闻视频. 2011-07-23 [2011-07-23]. ^ Blasts and Gun Attack in Norway; 7 Dead. 纽约时报. 2011-07-22 [2011-07-22]. ^ Man Held After 91 Killed In Norway Attacks. SKY News. 2011-07-23 [2011-07-23]. ^ 谌融. 挪威王妃继兄弟被证实在于特岛枪击案中丧生. 中国日报. 2011-07-25 [2011-08-05]. ^ 挪威警方调查枪击案共犯. 搜狐滚动. 2011-07-23 [2011-07-23]. ^ Anders (32) i Oslo ble pågrepet etter bombe og massedrap. Nyhetene. 挪威: TV 2. [2011-07-22]. ^ Named: The blond Norwegian, 32, arrested over 'holiday island massacre' and linked to Oslo bomb blasts, which killed 7 people and injured many more. 每日邮报 (英国). 2011-07-22 [2011-07-22]. ^ Pågrepet 32-åring kalte seg selv nasjonalistisk. Nett. 挪威: VG. [2011-07-22]. （原始内容存档于2011-07-26） （挪威语）. ^ 42.0 42.1 澳媒：布雷维克承认制造挪威惨案. 新华网. 2011年7月25日 [2011-08-03]. ^ 挪威“杀人狂徒”两大愿望落空 将被拘押8周. 中国新闻网. 2011年7月25日 [2011-08-03]. ^ 疑兇布雷維克右傾兼反伊斯蘭. Now新聞台. 2011-07-23 [2011-07-24]. ^ 46.0 46.1 46.2 挪威袭击堪比"911" 嫌犯疑为"基督教激进分子". 中国新闻网. [2011-07-24]. ^ 挪威枪手曾表示敬佩普京 普京发言人“撇清”. 凤凰網. 2011年7月27日. ^ 挪威枪击案凶手承认自己独立作案 不存在第二名枪手. 搜狐转中国日报网. [2011-07-24]. ^ BBC News. "Anders Behring Breivik: Norway court rules him sane". BBC News. 24 August 2012. ^ Reaction to Norway attacks: world leaders condemn violence. 英国卫报. 2011-07-23 [2011-07-24]. ^ Norway mourns as toll from twin attacks reaches 92. Irishtimes. 2011-07-23 [2011-07-24]. ^ 挪威近20万市民哀悼76名遇难者 将善良和爱涂满城市. 福音时报. 2011-07-27. （原始内容存档于2013-04-24）. ^ Glenn Beck hits 'new low'; compares Norway victims to Hitler Youth（格倫·貝克挑戰新下限，將挪威襲擊受害者與希特拉青年團對比）. 洛杉磯時報. 2011-07-25 [2011-07-29] （英语）. ^ Glenn Beck sammenligner AUF med Hitlerjugend. bt.no. 2011-07-26 [2011-07-29] （挪威语）. ^ 挪威全国降半旗向血案遇难者致哀 为遇难者举行葬礼. 凤凰. 2011年7月30日. ^ Räsänen: Suomi suruliputtaa sunnuntaina [Räsänen: Finland will fly flags at half mast on Sunday]. Ilta-Sanomat （芬兰语）. ^ Olof Svensson, Josefin Karlsson. Hela Norden hedrade offren med tyst minut. Aftonbladet. 25 July 2011 [25 July 2011] （瑞典语）. ^ Lars Løkke: Vi må stå sammen med Norge [Lars Lokke: We must stand together with Norway]. 丹麦 （丹麦语）. ^ Oslon pommi-isku 22.7.2011. 新闻稿. 芬兰: 芬兰外交部. 2011-07-22 [2011-07-22] （芬兰语）. ^ Oslon räjähdys vaikuttaa koko Pohjolan turvallisuustilanteen arviointiin. 新闻发布会. 芬兰: 芬兰广播公司 (YLE). 22 July 2011 [2011-07-22] （芬兰语）. ^ Condolences to the norwegian people. IE: RTE新闻（英语：RTE News）. 2011-07-23 [2011-07-23]. ^ Kungen kommenterar händelserna i Norge. SE: Svenska Kungahuset （瑞典语）. ^ Uttalande av Fredrik Reinfeldt med anledning av händelserna i Oslo [Statement by Prime Minister Fredrik Reinfeldt on the occasion of the events in Oslo]. SE: Regenringen （瑞典语）. ^ Vinthagen Simpson, Peter. Carl Bildt: 'We are all Norwegians'. 瑞典: TheLocal. （原始内容存档于2011-07-24） （英语）. ^ 温家宝就挪威爆炸和枪击事件向挪威首相致慰问电. 中国政府网. 2011-07-23 [2011-07-23]. ^ 奥巴马慰问挪威民众 强调全球共同反恐. 凤凰网. 2011-07-23 [2011-07-23]. ^ David Cameron condemns Norway attacks. BBC新闻. 2011-07-23 [2011-07-23]. ^ 英国首相卡梅伦谴责挪威发生的攻击事件. 凤凰网. 2011-07-23 [2011-07-23]. ^ Oslo : "acte odieux" (Sarkozy). 费加罗报. 2011-07-23 [2011-07-23]. ^ Oslo bomb – latest updates. BBC新闻 (UK). 2011-07-22 [2011-07-23]. ^ Norway: Security Council deplores deadly terrorist attacks. 联合国新闻中心. [2011-07-24].